Hyatt Regency London - The Churchill does not offer on-site parking. For parking recommendations, please contact the hotel directly at +44 (0)20 7299 2008. We are 2 minutes walk from Marble Arch - Central Line and 5 minutes walk from Bond Street - Jubilee Line. There are many buses close by as we are 2 minutes walk from Oxford Street. The Montagu Kitchen is an all-day dining destination perfect for eating, drinking and socializing in a relaxed and welcoming environment. Taking inspiration from the National Trust’s Chartwell House and Garden in Kent – Winston Churchill’s illustrious former residence, The Montagu Kitchen menu celebrates the best of British produce enthused by the changing seasons. With nature at the heart of the menu and interiors, The Montagu Kitchen is perfectly situated overlooking Portman Square just a short walk from Oxford Street and Marble arch, tucked away in upmarket Marylebone. We have been coming here for years. They have recently changed the menu. The chefs were very accommodating with requests and service and food was excellent as always. We will of course be returning! Spacious. Set menu is good value. A little noisy (one of my guests was elderly with a bit of hearing loss, and it wasn't ideal for that). But a useful central meeting place. I took an old friend here for lunch and we really enjoyed the set lunch menu which is good value for this part of London. Friendly, efficient service and genuinely lovely staff made our lunch special. I have eaten here several times and will be back again! Wonderful food, champagne kept flowing with fantastic staff who looked after us all, especially the lovely chef who baked amazing gluten free desserts for our sister! The format changed and (having spoken to other diners) left a lot of us extremely disappointed. The main course is now a la carte which is fine however all dishes are served with bland boiled cauliflower & broccoli even the cauliflower steak!!? The starter table consists of mainly vegetables and salads, only plain ham and pepperoni on the charcuterie board (I could get more variety for £3 at Sainburys) gone are the prawn cocktails, scotched quail eggs and breakfast buffet items one expects for brunch. The cheese board had pre-cut cheddar-like cheese and one blue cheese all inedible due the crust forming from extended exposure. No brie, camembert, goats cheese, manchego etc. The staff were wonderful as usual but the experience is no longer decadent, I feel cheated paying more money for lesser quality. Unless this changes back, after nearly 10yrs I will not be returning. This is our second visit to The Montagu Kitchen. We enjoyed it, though the selection of food is not as good as last December (both occasions are the same price). Staff are attentive and friendly. Good ambience. The Churchill Hotel is a luxurious oasis of calm on the edge of Portman Square and very conveniently situated just north of Oxford Street. The Montagu Kitchen restaurant is a quiet, elegant and spacious venue offering well prepared European- style food and a good wine list. 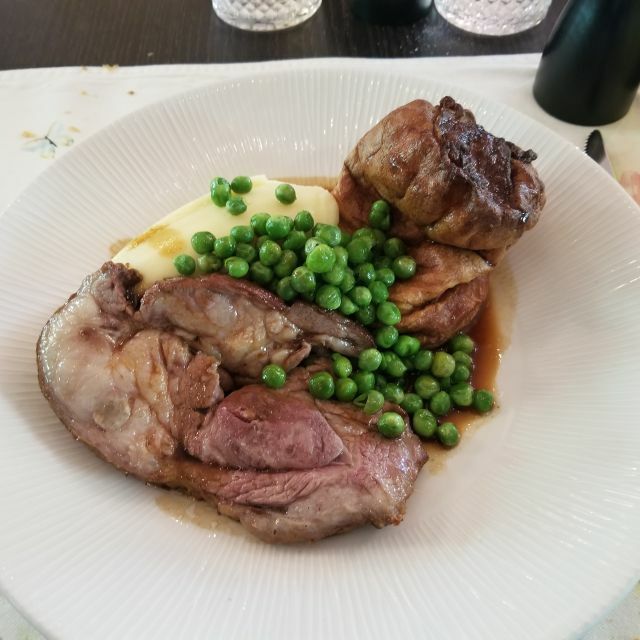 The set lunches and dinners are good value for the quality provided and the restaurant excels in its professional, discrete yet friendly service. There is some background music but, overall, it is a place where you can enjoy quiet and intimate conversation as friends or as a business group. Had a lovely meal here on NYE. Ate off the festive menu and the food was gorgeous and very tasty.... plus the size of the meals was the perfect size! Service was amazing and a big thank you to the waiter that we had as he was very friendly. Vastly overpriced for the quality of food and level of effort put into Christmas Dinner. When you are charging 110 pounds per person, minimum standards must be met, and the Montagu failed to meet them. The small 5 oz filet was clearly neither prime beef nor aged at all. The turkey option was a dried out roll of turkey and dressing that appears to have been prepared well in advance and merely heated up. The dessert table was what you would expect at a children's buffet table for a typical Sunday meal. Big mistake. Had booked our annual Christmas lunch on a Saturday for 13. Incredible service. I had sent orders prior to booking and every seat was named along with Christmas crackers. The food was great, only issue was the vegetarian main, which wasn't enjoyed by both vegetarians. The service made the meal and the staff are a credit to the restaurant. Had the festive afternoon tea. Sandwiches were delicious. Scones are the big ones, not the mini scones so at the end we were full. Overall experience was very good. It was noisy at first due to a group/company business party but once that was finished it was lovely and relaxing. Staff are helpful and the atmosphere pleasant. Would recommmend for a casual afternoon tea and catch up or business lunch. We always come to the restaurant in early December for the Sunday brunch and always enjoy. This year they have introduced a fish and seafood bar which part of my party loved but I noticed that there was less for the vegetarian. Shame. Also less choice with desserts. No home made chocolate. What a shame, particularly as the price has gone up considerably since last year. I'm giving the food 2 stars because I've had a lot worse, but it was really a little disappointing. Starter was passable though uninspiring, the main - I had slow cooked lamb cannon which was surprisingly tough. Broccoli and the lamb sauce terribly over salted. Gave up on the lamb, too chewy. My friend had rib-eye steak medium-rare, which arrived very rare though just about acceptable. Presentation was ok, but cooking seriously lacking, sorry. Staff were friendly, wine ok but London prices of course! London. The sandwiches, scones and cakes were incredibly tasty and nicely presented. All the waiters were very polite and did a great job! I would definitely recommend the Montagu for anyone who is looking for a sophisticated afternoon tea. Definitely very poor service and extremely noisy, even when furthest away from the singer and guitarist. Best avoid if you need some peaceful food. Montago use to be a very good restaurant. Everything is different. Looks like a very expensive fast food. Poor service, poor quality of food. Very disappointed. I won't go again. Very disappointing. Was told they did not have our booking despite me having two email confirmations. Asked if we had booked for hot food? Not sure what he meant. He then gave us menu's whilst sighing deeply. Offered not a very pleasant positioned table despite restaurant being three quarters empty. Was told nicer tables were reserved. I pointed out that I had booked a table a week ago. Cannot comment on the food as sadly we decided to leave due to our frosty welcome. Had been really looking forward to our meal. The restaurant was so proud to be refurbished with the theme of Churchill’s garden but it was a bit too much. We were there having a business meal and the service was a bit slow and the Caesar salad (it was a hot day we only wanted something light) was sub standard. Coffee was amazing though! I hope they will improve. Food & service were very good, particularly liked the French 75 cocktail. Poor steak which was removed from bill. Lamb excellent. Good wine. Getting an after dinner drink and smoke was very difficult / cumbersome and seemed as if you had not just spent time with them in their restaurant. We had a smoke by the front door before leaving early! A very underrated restaurant for a business lunch. Choice of a menu fixe or a la carte. it has long been a favourite. Food excellent, and staff attentive without being intrusive. Tables are set well apart so no danger of "spilling any beans". I like it and will continue to use it from time to time, when in the Portman Square area. We were on holiday from the US at the Hyatt Churchill for a week. Though we enjoy exploring local restaurants, the long touring days sometimes make you want to just stay on property. So glad we did. Ended up with one lunch and two dinners at Montagu over the course of the week. Selction and quality always first rate, and appreciated the all day dining menu for basics and comfort food when needed. Lucky enough to have Joseph (sp?) as our server at two dinners. He (and his petite lady server partner) were extraordinary in service, focus and tiny details. Always anticipating and noting if something was perhaps not exactly what my daughter or we were looking for. Well done Joseph and Hyatt! Good quality food and surrounding. A special mention is the excellent service. We were well look after. Unfortunately the ambiance is lacking as the restaurant is open to the hotel lobby and feels like you are eating in the lobby with people walking by. The food was disappointing. My steak was not served hot and was chewy - not tender at all. My wife's fish was tasteless and not filleted correctly with excessive bones in every bite. On the positive side, the service was fine, side dishes of spinach and potatoes were yummy, and we had a nice bottle of wine. But overall, we don't recommend a special trip to this restaurant for a meal. Fabulous champagne brunch on Easter Sunday, can't recommend it enough. I have been few times to this brunch and it never disappoints, dishes varies and lovely restaurant staff. You're in for a treat. Absolutely perfect. Went for mother's day and couldn't have asked for more. Excellently prepared food in the open kitchen. Good value set Meal menu. Wines by the glass prohibitively expensive, though. The food was very good, particularly the cod. The 2 types of bread served at the start of the meal were fresh, warm and plentiful. I tried an IPA actually brewed in India that was lovely, if expensive at £8 a bottle. Amazing Brunch, delicious food and impeccable service. Amazing service, the staff were truly amazing and great afternoon tea! A hidden gem, will be back again! A fantastic all-can-eat buffet with unlimited champagne and wine. Starters are particularly delicate and well prepared. Staff are extremely efficient at topping up your glass. In addition to main courses like a sunday roast, chicken, salmon and usual trimmings, they do a nice line in scrambled egg, sausage, bacon and mushrooms. Well worth a visit.